Last week the Federal Reserve raised the “Federal Funds Rate” after years of rumors that they would do so. The media got very busy discussing what that means for the economy, and for other interest rates that are important to consumers — including mortgage loans. The first thing you may notice is that mortgage rates peaked at about 18% in mid-1981. 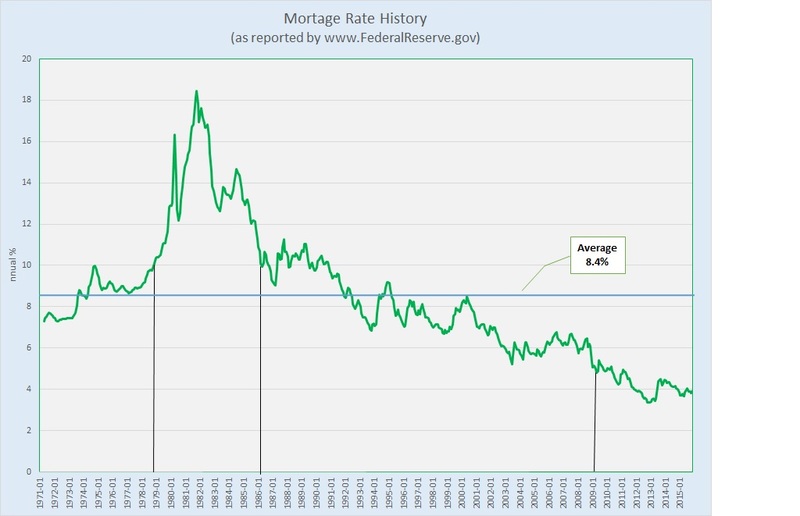 Notice also that mortgage rates were above 10% for more than seven years, from late 1978 to early 1986, and returned to that level for most of 1987 through 1990, for a total of about eleven years. We are now approaching seven years with mortgage rates below 5%. For many that has come to feel “normal,” but for much more time during the past forty years, rates were actually two or three times as high, and higher. In fact the average mortgage interest rate since 1971 was 8.4%. Now, back to the Federal Funds Rate. That is the rate for overnight loans between banks for funds maintained at the Federal Reserve. A change in the fed funds rate can affect other short-term interest rates that consumers will notice. A change in the fed funds rate may also affect valuation of stocks in some publicly traded companies, and in that way affect funds available for investors to spend and invest elsewhere. 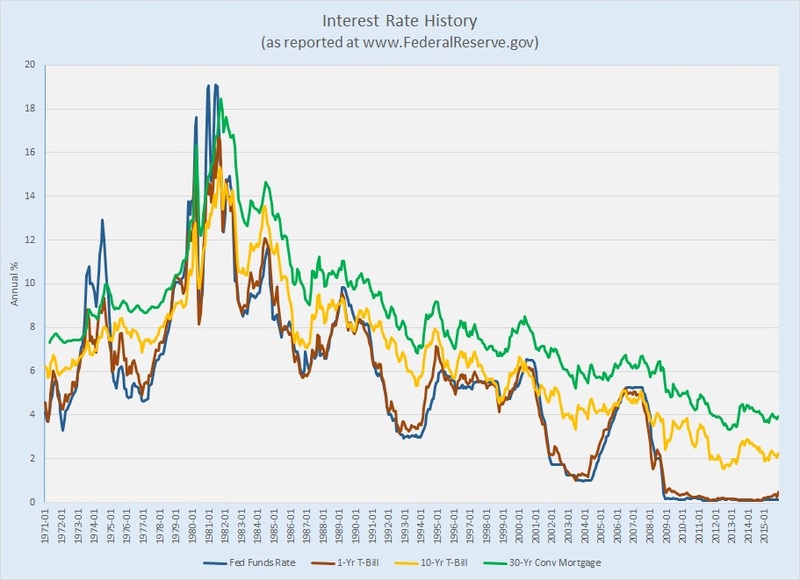 It’s clear that rates available on 1-year Treasury bills tracks the federal funds rate very closely, but notice that the path of mortgage rates reflects rates on 10-year bonds instead. Long-term investors have alternatives in deciding where to invest. Buying mortgage loans (or more likely packages of loans) is somewhat more uncertain than a U.S.-government backed securities, and so provides a larger return. There are certainly times in history when mortgage interest rates increased at the same time as the federal funds rate — in the early 1980s, for example, and in the mid-1990s and again in 2000-2001. On the other hand, the fed funds rate increased by about 67% from 1987 to 1990, and mortgage rates did not respond noticeably. And the fed funds rate more than tripled between 2004 and 2008, but mortgage rates barely budged. The reason is that market conditions — investment alternatives, the demand for mortgage loans, and a viable secondary market for mortgages and mortgage-based financial products — really drive the mortgage business, not the shortest-term bank-to-bank interest rate established by the Fed. So, is the sky about to fall for prospective home buyers? Not likely. At least there’s no reason to believe that last week’s decision by the Fed will cause that to happen. Will mortgage rates increase? Probably, but predicting when is a very uncertain science. If you want to prognosticate, watch the 10-year Treasury and you may see that rate leading mortgage rates by a week or two. If you want to buy or sell a house, though, just do what makes sense for you, in terms of finance and timing. I’ll have more to say in another post about what changes in mortgage rates would mean to home buyers, but whether and when those changes might happen has very little to do with the Federal Reserve Board.